The session on Friday remained much volatile while the benchmark NIFTY50 swung nearly 80-odd points back and forth amid good amount of volatility. The Markets saw a sharp decline in the late morning day while dipping to the day’s low of 10597.10, but recovered over 80-points before ending the day with net gains of 30.05 points or 0.28%. The Markets have ended the day near the high point and speaking purely on technical note, the Markets are expected to open modestly into the green and continue with its up move, at least in the initial trade. Though the technicals remain slightly overstretched on the Daily Charts, some more upticks with intermittent corrective bouts may not be ruled out. The levels of 10705 and 10760 will play out as immediate resistance area for the Markets. Supports come in at 10655 and 10610 zones. 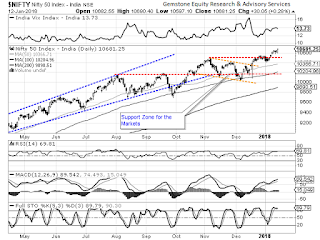 The Relative Strength Index – RSI on the Daily Chart is 69.8058 and it has continued to mark its 14-period high which is bullish. It does not show any divergence against the price. Daily MACD is bullish while it trades above its signal line. On the Candles a Doji emerged. Also a candle with a long lower shadow emerged. However, these have occurred during an uptrend and the Doji has not gapped above the previous bar and therefore they are less significant in the present context. The pattern analysis clearly show the rally that emerged after the NIFTY broke above the 10490-mark being extended further. There are chances that the NIFTY tests the 10750-10775 mark and thereafter sees some corrective consolidation happening again. Overall, there is still some steam left in the Markets to extend its present rally before it starts consolidating again. However, this further up move may be accompanied with minor corrective bouts. Also, we expect the coming sessions to remain somewhat ingrained with volatility as well. 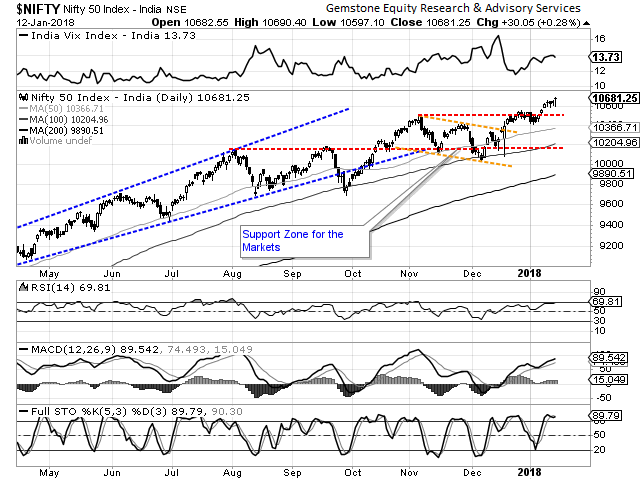 With no signs of any retracements, we recommend picking select stocks and keep effectively rotating the sectors while the Markets reaches for its over-head resistance area once again. Cautious optimism is what is advised for the day.